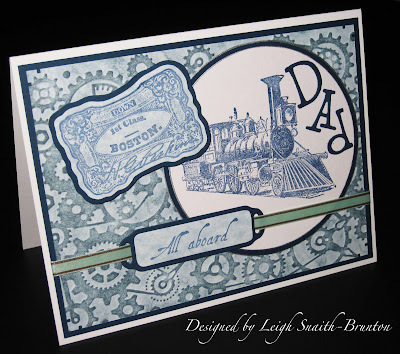 Velvet Paw Creations: "All Aboard For Dad's Day!" Part 2 featuring the newest stamp releases from Blockheads Paper Arts! "All Aboard For Dad's Day!" Part 2 featuring the newest stamp releases from Blockheads Paper Arts! As promised here's my 2nd 'All Aboard for Dad's Day' card to inspire you! I decided to post earlier than I said I would too coz I just couldn't wait to show off this handsome card ;0) I've been busy creating masculine style cards that are perfect for the guys and I shared my first card on Monday, click on the photo below if you missed it! Both of my cards have a blue monochromatic colour scheme and feature the exciting new stamp designs by Blockheads Paper Arts! The new images are awesome especially if you're into Steampunk! 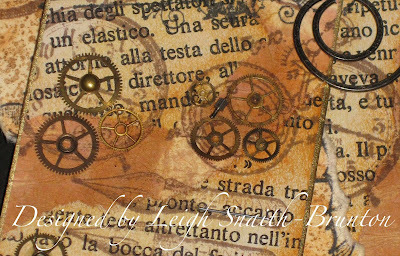 But my cards demonstrate how you can use them even if you're not a fan of the Steampunk craze. 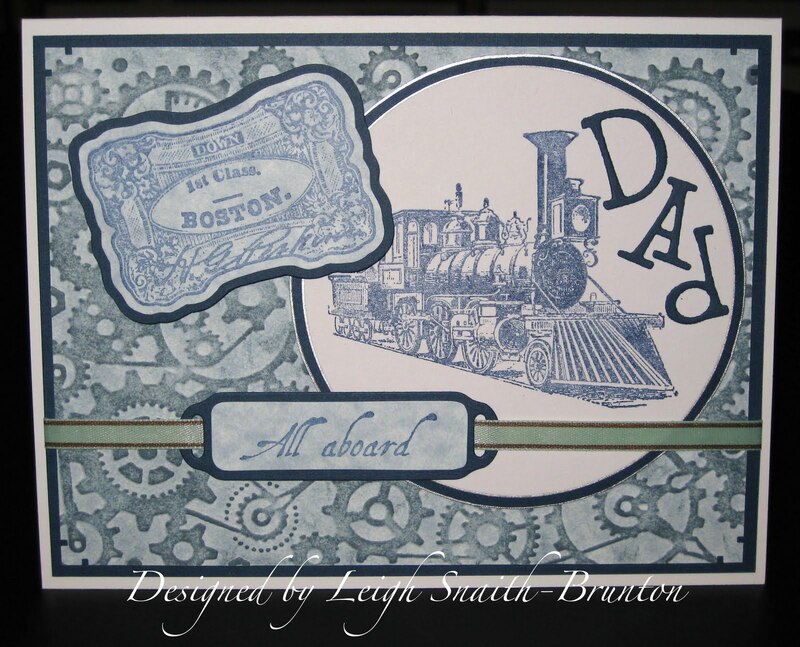 Today's tutorial features stamps from the Vintage Railway sheet. See below for the tutorial photos! 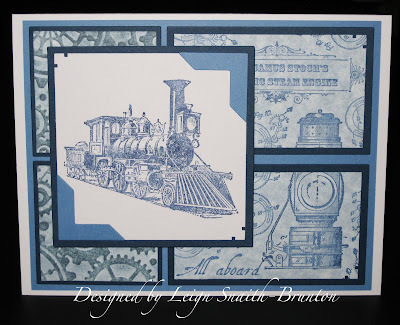 Stamp the Vintage Train Illustration in Ancient Page Indigo ink on white cardstock and cut it out with a circle die. Edge the circle with a broad point silver metallic paint pen. Cut a slightly larger circle from Indigo cardstock and adhere the white panel to it with permanent adhesive tape. Edge the Indigo mat with the silver paint pen too. Punch out the letters in Indigo cardstock with the Wingo Zingo alphabet sizzlet decorative strip die by Sizzix and adhere to the panel with a glue stick. Emboss a sheet of the white/blue mottled cardstock with a Clockworks Cuttlebug embossing folder. Apply Weathered Wood Distress Ink to the embossed design using the Direct to Paper method, for newbie stampers that just basically means you apply ink directly to the cardstock with the ink pad, making sure the ink just goes onto the embossed design. Trace the inside edge of a Spellbinder Label die with a pencil onto the white/blue mottled cardstock and with the aide of a stamp positioner, stamp 'All Aboard' from the Vintage Railway sheet in Indigo Ancient Page dye ink. Punch out the Label die from Indigo cardstock and adhere the stamped panel to it with permanent adhesive tape. 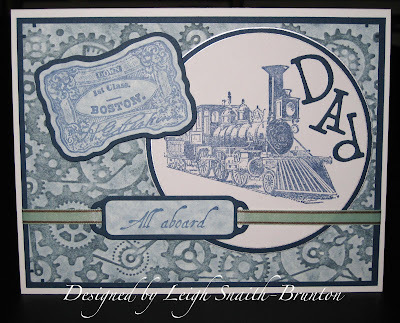 Stamp the Vintage Railroad Ticket in Indigo Ancient Page dye ink onto the white/blue mottled cardstock and cut out. Adhere the ticket to a scrap piece of Indigo cardstock and trim. Make a folded card from white cardstock and use a scoreboard to score the fold. Cut a mat from the Indigo cardstock slightly smaller than the white folded card then cut the Clockworks embossed cardstock slightly smaller still. Corner punch all 4 corners of the embossed panel with a Southwest design corner punch. Adhere the Clockworks panel to the Indigo panel with permanent adhesive tape. Then adhere the focal point of the card, the train panel, with permanent adhesive tape to the upper right hand side. Cut a length of colour co-ordinating ribbon and thread the Label onto it. Put two pieces of double sided sticky tape on the back of the large Indigo panel and a small piece on the back of the ribbon Label and ribbon. Position the ribbon Label on the front of the card and wrap the ends of the ribbon over the edges and adhere to the back of the Indigo mat onto the pieces of tape. Then adhere the large mat to the white folded card with double-sided sticky tape. Finish off by adhering the Vintage Railroad Ticket with pop dots for dimension. I love the monochromatic colouring of this card and the ribbon just adds that extra touch without making it too fussy! A very handsome card that's perfect for the guys! I hope I've provided you with some inspiration for making masculine cards and for trying your hand at monochromatic colour schemes! Here's a sneaky peek at my next Blockheads project! Check out my fellow Design Teamster's blog for more Blockheads inspiration, Dreaming and Creating with Karen! Have a great weekend and Happy Father's Day to all the guys! Great stuff, I have been looking for more manly designs. I do love the cuttlebug folder is great I'll have to look for that one. And I love the stamps too.